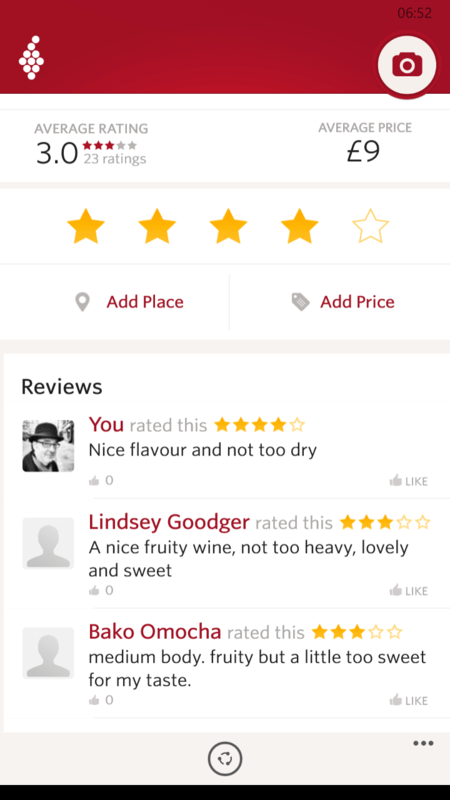 The popular Vivino app for Windows phone has been updated this week with several new personalizing features including a new Personal Taste Profile. I reviewed Vivino Wine Scanner a few months back and it remains one of my favorite apps for rating wines I try and getting ratings for a bottle before I buy it. It is a gem of an app. Related to this is a new in-depth description of over 250 regions in Vivino for Windows Phone. This is aimed to help you learn about your favorite wines and to get more confidence as you make your wine selections. Finally there is a new badges ranking system that allows you to become an expert in a particular type of wine based on your experiences with those wines. It adds a social element to the app. Whether you are a wine exper or just looking for that great bottle of wine to accompany your dinner tonight, Vivino for Windows phone is a great way to check out new wines and give them your own personal ranking. The app is free and the Pro version is $4.99. If you have your own cellar then the Pro version is the one you need as you can track your cellar with it.